Announcements, new pattern releases and other updates. For Pattern Support click here. For Quilts for sale click here. Open House Show February 23,24 from 9am to 4pm. 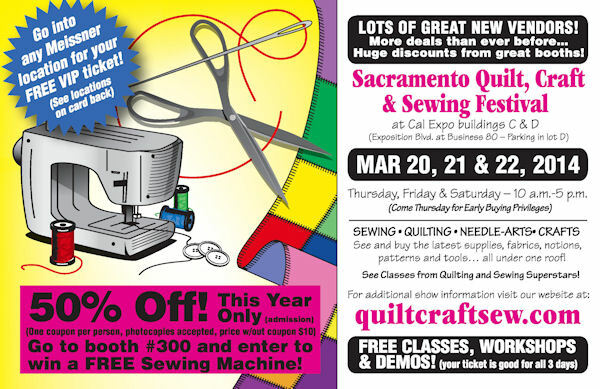 2016 Quilt and Sewing Festival in San Mateo, CA February 18,19, and 20. Here is a coupon for free admission! Go to quiltcraftsew.com for more details. American Jane is again having an Open House to sell multiple lines of American Jane fabrics, kits, patterns, books and quilts. The newest line, Fresh Air, will be featured along with all the patterns from that line. Bring your friends and join the fun on Friday and Saturday Feb 6 and 7 from 9:00-4:00. 64 Sandy Lane, Walnut Creek, CA 94597. Ph: 947-3977. 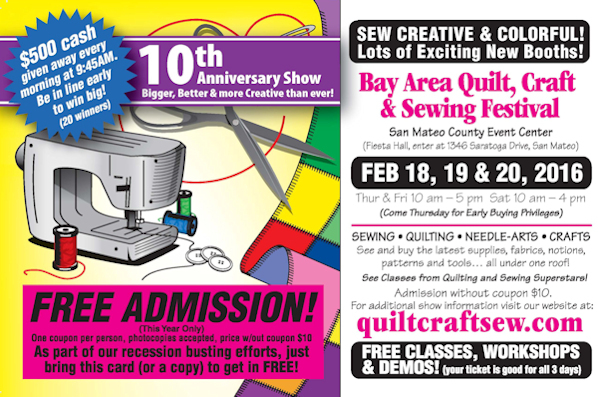 The next show will be the Quilt and Sewing Festival in San Mateo, CA February 19-21. American Jane is again having an Open House to sell multiple lines of American Jane fabrics, kits, patterns, books and quilts. The newest line, A la Carte, will be featured along with all the patterns from that line. Bring your friends and join the fun on Thursday and Friday 25-26 September 2014 and also the following Saturday the 4th of October from 9:00-4:00. 64 Sandy Lane, Walnut Creek, CA 94597. Ph: 947-3977. American Jane is again having an Open House to sell multiple lines of American Jane fabrics, kits, patterns, books and quilts. The newest line, Ducks in a Row, will be featured along with all the patterns from that line. Bring your friends and join the fun on Friday, Saturday and Sunday, May 23, 24, 25 from 9:00-4:00. 64 Sandy Lane, Walnut Creek, CA 94597. Ph: 947-3977. Get 50 percent off entrance. Ecology cloth muslin - extra crispy muslin that makes piecing easier. fabric line now available in stores and online. Happy Campers fabric line now available inn stores and online. as well as some finished real vintage handmade quilts. to get the original. Have a look!